BELIZE CITY, Thurs. Apr. 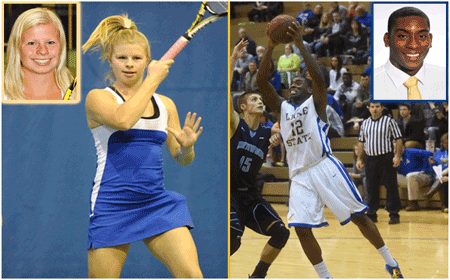 14, 2016–We are happy to share the article below on Belize’s Devin Daly, “playing Big” in the U.S.
Devin Daly helped lead Lake Superior State men’s basketball program to the most successful four-year stretch in the program’s history, while Sarah Awe recently capped her stellar career finishing ranked fourth in combined wins for the women’s tennis program. Both seniors were honored Tuesday evening (April 12) at the annual Laker Club Athletic Awards Banquet held at the LSSU Cisler Center. Sarah Awe (Washington Township, Mich.) received the Deb McPherson Female Athlete of the Year Award and was joined by men’s basketball senior Devin Daly as the Cliff Everett Male Athlete of the Year…. Daly, a native of Mahogany Heights, Belize, has called Sault Ste. Marie home for the last four years and helped coach Steve Hettinga ‘s group earn a program-best record of 88-36 during his time. This season, after developing as one of the premier sixth-men the Great Lakes Intercollegiate Athletic Conference had to offer as a junior; Daly earned GLIAC Player of the Year nominations and was named to the First Team All-GLIAC and All-Midwest Region First Team. The 6-4 forward finished second overall in scoring with 21.8 points per game, ranked fifth overall in the GLIAC with 8.5 rebounds per game, and was named GLIAC Player of the Week three times. Daly was also named U.S. Basketball Writers Association Division II National Player of the Week once this season.